We purchased our first home via auction, a rather nerve wracking yet exhilarating experience. Flushed with success we began attending farm auctions and furnished our home with our finds, on a shoestring budget we were selective in our bidding. Eventually we were to also discover the world of garage sales, a story for another day. Months after purchasing our home we were expecting our first babe, this was when I discovered the attraction of the op-shop hunt. It wasn’t long before I realised that one could dress yourself and your loved ones well by selectively searching for quality amongst the dross. Years on I’ve continued to maintain my passion for the hunt of a bargain and have learnt a few ‘tricks of the trade’ along the way. Making your rounds through the shops on a weekly basis will generally score you a great find or two, mid week’s a good time as they’ve had time to sort and place out the weekend donations. Being a home educating mama I’m not able to go regularly these days, so we make an occasion of it in the holidays, our ‘girls day out’ that we look forward to. Some towns/suburbs have better quality items, though the pricing will be higher to reflect that. Whilst our town of 20,000 has 8 op-shops it has a lower socio-economic population so the clothing reflects that. After years of shopping there are some op-shops in our town I don’t even bother checking. They never have the items or the quality I am looking for. Yet there are other shops I check as often as I can and on our big day out we’re likely to find a bargain or three, though bargain hunting comes with no guarantees. In one shop I often find items for myself, in another I’m more likely to find articles for the children. Be aware of, and utilise sale days and sales. Whilst you may be shopping for a particular item, if you see a quality item for another family member or one that you can use ‘down the track’ grab it. ie when shopping for size 1 clothing for my baby, if I see a quality item in a size or two larger I buy it, particularly if the pricing is minimal. It comes with practice but you can learn to scan and save yourself time, particularly if shopping with children then you are a heat seeking missile. Many shops kindly array ladies clothing via colours. In your initial scan you can gravitate immediately to the colours that complement you, skipping the ones that make you look unattractive. If the shop isn’t set up that way, don’t even give colours that are not ‘you’ a second look. Flipping through the potentials assess the fabrics, if it’s not a fabric/texture you like then don’t even bother removing from the rack. Does the style make you feel good? I now have a sense for what cut is flattering on me and what is not. Even though an article may hit my ticks on every other level I don’t bother trying on the unflattering (for me) style. Home in on quality labels, they last the distance and are most flattering. Think you have a potential bargain? Do a quality control check or you will be disappointed when you discover the imperfections at home. Sometimes it may only require a simple repair that you are happy to undertake but its much nicer to know prior to purchase. So what to check for? Can the outfit/material be altered to still be useful? For many years I rejected clothing articles that were nearly but not quite right. It’s only recently that I’ve discovered the world of upcycling (cool name) and realised that a simple alteration, or maybe major one, can transform a nearly to a match. A snip here, a tuck there, a removal of a ruffle, a basting of a seam can make a nearly a match. Perhaps you can a rip an outfit totally apart to produce material for a whole new outfit, or you may score a doona case that can give you material for a project. Ask yourself though, will you do it, if it’s going to sit unaltered in your mending pile, leave it. I never buy underwear, I mean really! Be very selective. I have scored brand new or barely worn shoes, I’m comfortable with that. But I won’t purchase worn shoes, someone else’s foot impression, not a good idea. Most shops wash all clothes before placing on racks. I always rewash though when I come home, I prefer to know the clothes are clean, and we’re a scent free household and mostly they smell of scented washing powder. *Do you enjoy a good bargain hunt? Any tips to add? Are you now inspired to ‘give it a go’? Do share your finds, I always love hearing of a bargain. Such a good list! I have most definitely made the quality control error before, bringing home pants in apparently good condition only to find the zippers don't work. One additional tip I got from Sarah at http://provincialhomemaker.blogspot.com/ really helps when I'm trying to decide how much to buy ahead when the price is good but storage is limited. She suggested that when you see something really special a couple of sizes ahead (e.g., in our case, the perfect boys' three piece suit or dress shoes or a lovely girls' dress or excellent warm winter parka) to go ahead and get them because equivalent items may not pop up again at the right time. Meanwhile, ordinary items like shorts or t-shirts or jeans can always be found in plenty in our area, especially in the younger sizes, so there's no point buying them four sizes ahead. I find this especially helpful in the smaller sizes (infant to 5T or so) because children grow so rapidly in the beginning and it's so hard to predict what season we'll be in when our kids hit a particular size. I've made the mistake of stocking up on pants "for the winter" only to have the twins outgrow them all by the middle of fall and jump three sizes by winter's end! In our area there are also a couple of really excellent consignment sales – huge events that fill an entire warehouse/convention center/church hall with thousands of items in each size. The price is perhaps a dollar or so more per item compared to the thrift store, but with so many little children who make regularly hitting stores a challenge, I've found it worth the slight extra cost for the benefit of a once-every-six-months event where my husband watches the children and I go with a list of everything we're missing and collect it all in a couple of hours. Also, very true about the location of stores! In our area there's one store with huge bins of small children's clothes all for 25 cents. Unfortunately, it's almost all poor quality and stained or pilling or just ugly. My mother, meanwhile, often drives to a wealthy town near her home to visit friends. That town has a thrift store chock full of gorgeous mint-condition high end children's clothes because it's the kind of area where people can afford to buy just one outfit for a special occasion and then dispose of it. She's found some lovely things for the grandchildren and we all benefit from her nose for a bargain. Thanks! Yes so annoying to discover when home. Very good tip from Sarah (I read her blog too:), and I certainly do the same with harder to find items such as pretty dresses, quality jeans. Though sadly quality clothes aren't that prevalent here. Your store sounds like a dream, I'd go crazy there! You have it down to a fine art Erin. Our eldest enjoys hunting for these bargains too, from time to time – often finding yet more books to try and squirrel away at home…. I generally don't look in Op shops, finding I need so little and also our children seem to require few clothes. Time is precious – my shopping is usually for food only…. 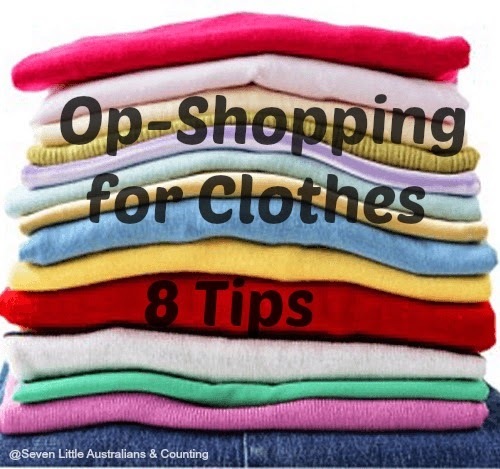 I love these tips, I've been seeing some fabulous op shops up here, you'll have to give me the run down on your favourite ones too. I love op shops. We have 5 in my town and I really enjoy taking a morning out from time to time to case the bargains. Over the years I've scored some amazing finds – it does pay to check them out often. Great advice – I love my op shopping and have my favorites…and to be honest my favorite clothes items are the ones I've discovered on the rack in the op-shop! There's more variety I think, not 50 of the same item. I love that when you're shopping with kids you're a "heat seeking missile" :). That's so true whether op shopping or not. You've only got limited time, so you need to be fussy and know exactly what will work. I find the op shops in my area disappointing. I think I will need to expand my horizons and explore other suburbs.